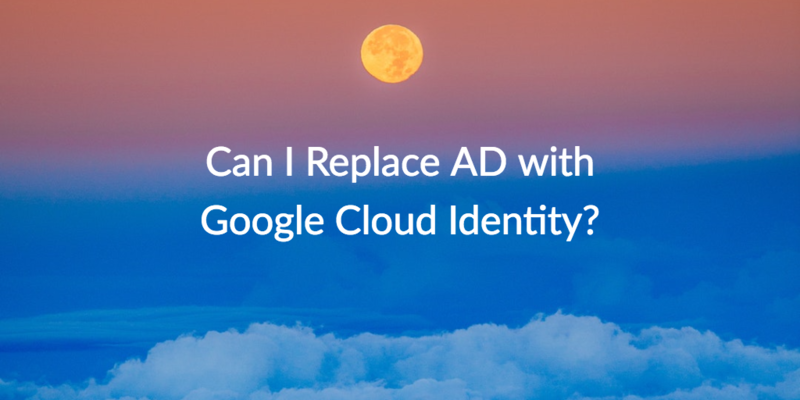 IT admins often ask us, “Can I replace AD with Google Cloud Identity?” It’s a logical question, given that modern IT organizations would like to eliminate the majority of their on-prem infrastructure in favor of cloud alternatives like G Suite, Google Cloud Platform (GCP), and Google Identity-as-a-Service (IDaaS). Well, we hate to be the bearers of bad news, but Google Cloud Identity is not a viable alternative to Microsoft® Active Directory® (AD). Fortunately, a new solution called JumpCloud® Directory-as-a-Service® has emerged that can function as an Active Directory as a service alternative. Active Directory has been the core identity provider in IT organizations for almost two decades. First introduced in 1999, AD was designed to provide user and system management capabilities for on-prem networks of Windows® based IT resources, which were dominant at the time. Examples of the these Windows based IT resources include on-prem applications and services like Office®, Exchange®, Windows File Server®, and more. Google Apps (now called G Suite) was a direct aim at replacing these types of on-prem Microsoft resources. However, interestingly, Google has not tried to replace Active Directory. In fact, Google has developed a number of tools, such as the Google Apps Directory Sync (GADS and now called Google Cloud Directory Sync), that are designed to complement AD. So, with the introduction of Google Cloud Identity, IT admins want to know if Google is now attacking AD directly. As mentioned, the short answer is no. Instead, Google Cloud Identity is their approach to centralizing Google hosted identities across their services. Google took this approach because they haven’t had a user management system that cuts across all Google apps and services. With Google Cloud Identity, that is now possible. Well, that’s all well and good for Google. The issue is that IT organizations are looking for a comprehensive cloud replacement to AD that cuts across virtually any IT resource, including Google services. They are not interested in another siloed management tool that must be managed in addition to managing AD. In fact, IT admins want to eliminate the majority of their on-prem infrastructure altogether. The good news is that a third party solution called JumpCloud Directory-as-a-Service can be tightly integrated with both Active Directory and G Suite. In other words, the cloud IdP can act as a bridge from AD to non-Windows resources like Google applications and services. As if that weren’t enough, the JumpCloud platform can also be a complete replacement to AD in the cloud. 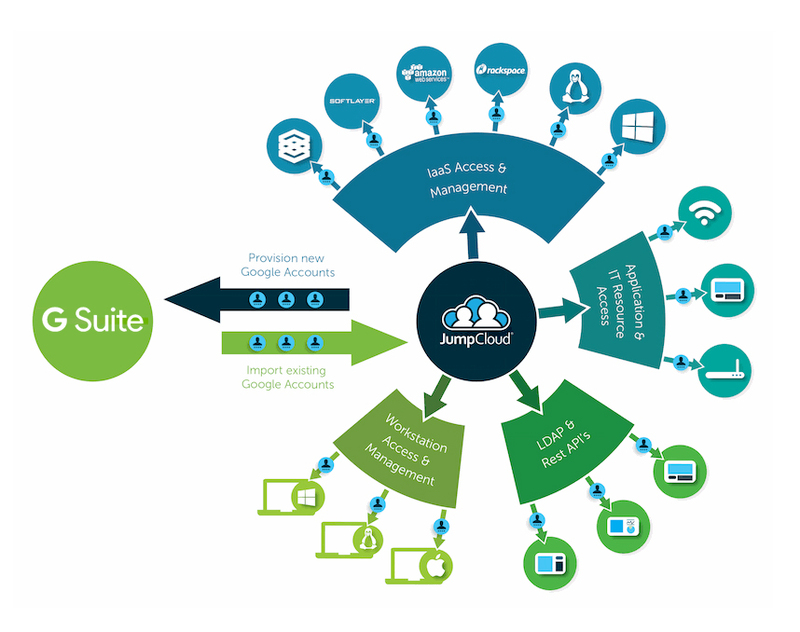 JumpCloud Directory-as-a-Service is a comprehensive cloud identity and access management (CIAM) platform that securely connects users to their systems, applications, files, and networks. This hosted management platform seamlessly integrates with G Suite and AD. In doing so, JumpCloud enables IT admins to federate on-prem AD identities to Google services like G Suite, GCP, and Google Cloud Identity, and more. JumpCloud Directory-as-a-Service can also be used as a full cloud AD alternative. This approach enables IT admins to eliminate the majority of their on-prem identity management infrastructure in favor of a comprehensive cloud solution. In other words, while Google Cloud Identity cannot serve as an AD replacement, JumpCloud Directory-as-a-Service can. Check out our whiteboard presentation to learn more about the JumpCloud integration with G Suite. You can also contact JumpCloud for more information, or sign up for a Directory-as-a-Service account to see how our cloud identity management platform can benefit your organization. Your first ten users are free forever to help you explore the full functionality of our platform at no cost.